With so many games involving random dice rolls, Safranito’s dexterity mechanic of throwing chips is both fresh and fun. 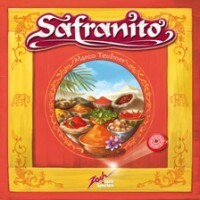 In Safranito, each player is a chef trying to collect the necessary spices to create spice blends. The spices are limited, so each chef must haggle to get what they want. Rather than a traditional verbal battle, players must haggle by using strategy and dexterity as they throw their different valued chips onto the spice board. It is this added element of chip throwing, combined with simple rules and quick gameplay, that makes this game fresh and appealing to a wide audience. Maybe your not as skilled at managing your money to buy and sell spices… you can still come out on top with some good chip throws! Your goal is to be the first to collect three spice blends. At the beginning of each round, a limited number of spice cards are drawn and placed next to board. These are the only spices available to buy. The board is nice and thick, and wonderfully illustrated. There are nine large spice bowl spaces and four special action spaces which are smaller and more difficult to land on. There is also a raised edge around the board that will stop chips from falling off, which can even be used strategically during a throw. Just be careful you don’t throw your chip too hard causing it to bounce over the edge! The more chips on the board when it is your turn to throw, the more interesting the game gets. Think of a game of billiards when there are lots of balls on the table, and you’re trying to get the cue ball so it lands just where you want it to. Each player is given six chips, similar in shape and size to poker chips. They have a nice weight to them because their centers are metal. One side is blank and the other side has a value (10, 20, 30, 40, 50 and 60). Taking turns, each player chooses one of their chips (not showing the other players what the value is) and throws it, value face down, onto the board. Then the next player throws a chip, and so on, until each player has thrown three or four of their chips depending on how many people are playing. • Want to sell a spice at a high price? Throw your highest valued chip on that spice’s bowl. If there are other chips in the way, you will have to use skill to get it there. • See someone with a chip on a spice bowl that will complete a set they are working on? Toss your chip at theirs with the hopes that it knocks theirs out! • Think you’ve got your chips where you want them? Just wait until the other players throw theirs. Once the chips have been thrown, special actions are performed. Special actions include throwing an extra chip, drawing cards and becoming the first player. Players then sell spices they’ve collected, buy spices that are available, and complete spice blends. Since everyone is working towards the same spice blends, it is important to make sure you complete it before someone else. Only two or three (based on the number of players) spice blends are worked on at a time. Once a blend is completed, a new blend is drawn at the start of the next round. At the start of a new round, new spices are added to the board in addition to any spices left from the last round. Play continues round after round, until a player wins by being the first to collect their three spice blends. Families will find high appeal in the simple rules, wonderfully illustrated components and familiar set collection mechanic. Children will especially enjoy the chip throwing. The social crowd will find that this game keeps everyone talking and interacting. Everyone is watching with anticipation as chips are thrown to see what happens and plan what to do next. Casual and avid gamers will enjoy developing their chip throwing skills. There is also plenty of strategy both in how you play and how you adapt based on what other players do. This is also a great game to bring out and play with friends and family that don’t usually play games. I found it very hard to find faults with this game. Younger children may have difficulty choosing which chip values to throw. They also may need assistance with the strategies behind buying and selling. In terms of gameplay, it can get frustrating to see your well tossed chips get bumped out of their spaces by other players. As far as the components go, I found that the box insert failed to hold some of the components in place if you tipped the box sideways or upside down. During each play through you’ll be refining your chip throwing skills. But no matter how refined, the chip throwing rounds are full of unpredictable results. This gives Safranito very high replay value. The quality of components was also very impressive. All of that, combined with a game that a wide variety of people will enjoy makes this a game worth adding to your collection. Like no other game before, Safranito is a combination of dexterity and tactics, providing the game with a new, superb playing experience. At an Indian spice booth, the players bargain for precious ingredients they need for their exquisite meals. Thereby, everyone throws their Indian coins face-down onto the bowls depicted on the game board. The players may bluff and push the opponents’ coins aside. A clever coin thrower is able to arrange the coins on the game board in a way that allows him to both sell his spices at a high price and purchase cheap spices as well. The players try to acquire the right spices as quickly as possible. As soon as somebody has cooked three meals with them, he wins. Safranito is a fantastic unique game that really gets you interacting. There are dexterity, strategy, and bidding components to this game. I first saw Safranito at a games night and was instantly drawn to how much fun it looked, everyone was having a good time throwing chips around and trading money for cards. My first thought was wow I have got to try this out, after getting in the next game it became clear that Safranito does not disappoint! The first player to complete 3 spice recipes is the winner so it is important to not fall behind. A round lasts until a specific number of chips have been thrown (2 players = 4 / 3 players = 4 / 4 players = 3) a game consists of several rounds. Players select what chip they are going to throw and take turns tossing chips one at a time onto the board. Spice bowls let you buy or sell that type of spice based on the value of your chips and the stock of spices available. The special actions are harder to land on because they are smaller and it’s easier to be knocked out by an opposing players chips but they provide some pretty useful abilities. The Head Chef, this ability becomes more useful the more games you play after gamers have a chance to learn the rules, it lets you break ties and complete recipes first. The head chef also determines the order that spice bowls / actions circles take place in. The Extra Recipe, this gives you an additional recipe option that only YOU can complete, a good one to consider if there spices for sale do not match the spices on current recipes or early on in a game to give you more options. Extra Spice Card, this is by far the most powerful space on the board, if you land a chip in this circle you get to look at the top x amounts of spice cards, keep one and discard the rest. X is the corresponding number on your highest chip in the space. Extra Throw. This space allows you to throw another chip right away, in any game I played we never could really figure out a use for it other than if you are good at knocking chips to where you want them to go. In order for a chip to be considered “in” the circle in the middle of the chip must be inside the spice bowl or action circle. Now let’s talk buying and selling. Selling: One spice at a time players are allowed to sell spices, their value is equal to the TOTAL number of ALL chips in a spice bowl however a player does not have to have a chip in the bowl to sell spices there. After you sell if you had any chips in that bowl you now remove them, this stops you from both buying and selling the same spice in a single round. ﻿Buying: One spice bowl at a time the player with the highest total chip value gets to buy first costing the sum of his/he chips, the player’s highest valuable chip is then removed and the second highest total gets to buy next even if it is the same player. Note that there is a limited supply of each spice and that supply is randomly replenished every round. At the end of a round once all the chip tossing is done with players get to complete recipes. The head chef gets first pick, as soon as someone gets a third recipe card the game is over and you have your winner. Note that when a recipe is completed a new one is turned face up at the start of the next round. Before we move on to who will like it and why lets take a minute to stop and take a look at the components, the art work is superb and the gameboard is good quality, the board is easy to setup (2 parts) and has a nice raised border around it to stop the chips from flying off as easy. The chips themselves are a good weight and feel nice in your hands. Nothing in this game is made cheap and that adds to the relaxing feel the gameplay in Safranito brings. Safranito is certainly a unique game that combines many mechanics I enjoy, but let’s talk about who else would enjoy it and why. Family Gamers: Safranito should definitely appeal to family gamers for many reasons, it is a relaxing game even with the ‘bumping each other’s chips’ part.Safranito provides a lot of player interaction and table talk. It has simple easy to follow gameplay, each round has 4 steps and the same 4 steps are repeated every round until the game is over. Casual Gamers: Casual gamers will enjoy Safranito for a lot of the same reasons family gamers should consider it, however because the ‘buy low sell high’ auction mechanic allows for more strategy and options, the recipes to be completed are random and so are the spices availble each time you play, Safranito is a game that can be replayed over and over. Gamer Gamers: Although this is not going to be the first choice for someone who enjoys in-depth gaming it is a perfect game to play if they are looking for something lighter to play with their friends. The chip throwing provides uniqueness that even a gamer gamer can appreciate and although the gameplay is not overly complex, it is smooth flowing and fun to play. I believe that most gamer gamers would not give Safranito a chance but would actually enjoy it if they did. Add a Review for "Safranito"